As the summer sun heats, all you can think about is relaxing in the shade. You can dress up your home with chic modern shades from Hunter Douglas. 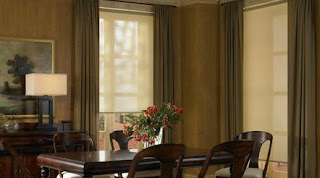 These designer screen shades gives you shade as well as view of the beautiful summer outdoors. I could use these! My home is south facing, so we get intense sunlight in the front rooms and I worry it will ruin the furniture. Would they work on picture windows? I enjoyed our site visit on Tuesday where we had fun sourcing all sorts of Hunter Douglas products for our ocean front window project.